Hotline Miami "Torrented to Extraordinary Levels"
It turns out Hotline Miami is really popular with those of the rum-drinking, parrot-toting persuasion. Do you know what pirates like? Free games. Do you know what they like even more? Tiny games with easily-broken copy protection. 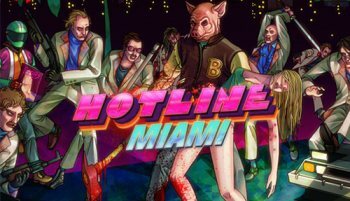 Games like Hotline Miami, for example. "It has been torrented to such a staggering level, and given the file size of it, I mean, you can't really be surprised, right? You could pass this thing around on the world's smallest memory stick," project manager, Graeme Struthers, told Eurogamer. "So it has been torrented to extraordinary levels." Some of the game's torrent popularity might be down to developer, Jonatan SÃ¶derstrÃ¶m's, decision to extend the olive branch to pirates rather than bellow legal threats at them. When a cracked and buggy version of Miami turned up on The Pirate Bay, SÃ¶derstrÃ¶m elected to help users who couldn't get the game to run and even suggested that the uploaders should update the torrent with a patched version of the game. "I definitely want people to experience the game the way it's meant to be experienced," he said at the time. "No matter how they got a hold of it." While SÃ¶derstrÃ¶m's pirate-friendly approach - and his willingness to engage with critics via social media - has bought him a lot of good will, it's unclear how many pirates he managed to convert into paying customers. Regardless, the game has done well for an excruciatingly hard indie project from an unknown developer, with around 130,000 copies sold in seven weeks.